Welcome our newest speaker to the Youth to Youth Speaker Service. While he is new to Youth to Youth , De’Marco is not new to youth audiences. For the past decade, De’Marco Fomby has been working to live out his passion — inspiring and motivating young people to become the absolute best they can be. Using his background in music, sports, and mentoring, he encourages middle and high school students to think for themselves and to make choices based on what benefits them in the future, rather than the here and now. De’Marco aims to help teens understand that there is power in their passions, and through those passions, they can change the world with their influence. 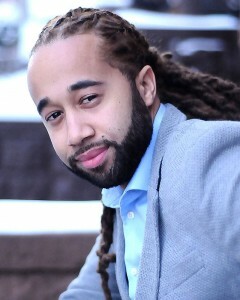 Nationally recognized speaker and empowerment coach, Shaun Derik has dedicated his life to the betterment of young people for more than a decade. Affectionately known as "The Speaker for the Dreamer," his message is genre resistant and addresses the key components necessary for the success of the 21st century student. His blend of motivation, comedy, live music and dance gives Shaun an uncommon edge, making him a competitor in the world of youth engagement. Students deemed to be disruptive, unreachable, or simply unengaged have benefited from his unique approach to teaching. Shaun was once a struggling student barely able to pass any of his classes. His relationship with a caring teacher who noticed his musical talent would teach Derik the importance of encouragement and hard work. It was then that he learned, "Success doesn't happen on accident... It happens on purpose." For years this dynamic speaker has been impacting lives across the country with his powerful message to never give up. 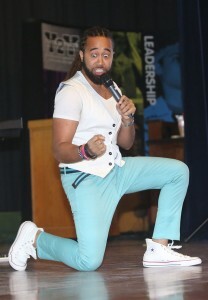 Through film, comedy and music he has had the opportunity to reach and inspire thousands of young people nationwide. This presentation will inspire you to push yourself regardless of previous doubt or failure. All the way from New York City, please welcome Shaun Derik. Using the metaphor, life is a song, Shaun teaches listeners to pay attention to the music playing in their heads and to be mindful of negative influences and how we treat others. Just like the components of a successful production, this presentation challenges you to learn, practice, and perform positive habits. With a strong background in the performing arts, Shaun combines the importance of vision and an awareness of the world around us with an unbeatable plan of success. He tells the story of his own struggles while exercising his acting muscles, displaying years of conservatory dance training, and ending every conflict-filled story with a powerful message to never give up. Never before have we lived in a time where so much power is at our finger tips. Though new technology has made life more convenient for some, social media and reality programming has made mindless behavior, bullying, and a lack of respect for others widely acceptable – making it hard for others to feel important. In the timely presentation, Use Your Inside V.O.I.C.E.’s , Shaun recounts his most burdensome years in grade school and how “finding his voice” helped him resolve his issue of not fitting in, having no passion, and his fear of standing up for himself and others. Using the V.O.I.C.E. system, students will learn the tools necessary to project their true self and become agent of change in their homes, schools, and communities. Nationally acclaimed youth speaker and empowerment coach Shaun Derik takes us on a journey into the minds of some of the most influential people of our time exploring the common trait that made them all famous; proper communication. With a person-to-person approach, Saying Something delves into the world of public speaking teaching adults how to be sincere, direct and transparent when dealing with young people. This workshop promotes connectivity over conversation and lives up to Shaun's personal mantra: "Speaking is easy... saying something is the hard part."